Tutorial – Using NeoPixels with Netduino Plus 2 @netduino #netduino « Adafruit Industries – Makers, hackers, artists, designers and engineers! 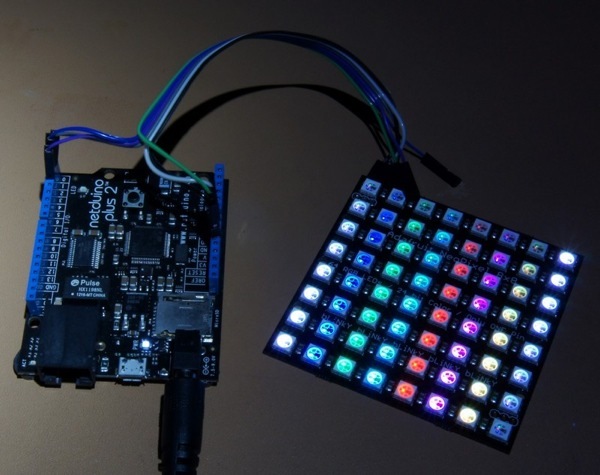 Tutorial – Using NeoPixels with Netduino Plus 2 @ The Adafruit Learning System. Good news for Netduino users who have been eyeing the glamorous NeoPixels strips and shapes in the Adafruit shop! We have managed to get NeoPixels working on the Netduino Plus 2 (shown below with a NeoPixel 8×8). Even though there is lots of example code for NeoPixels for AVR, Propeller and PIC chips, it’s a bit of challenge getting these LEDs to work with the Netduino. With the default firmware of the Netduino (any variation, Plus or no), it is not possible to send data to NeoPixels.